Obama Will Travel To France For D-Day Anniversary : The Two-Way Obama is currently hosting French President François Hollande for a state visit, the first to the White House in about two years. President Obama gestures toward French President Francois Hollande during their joint news conference on Tuesday. During a joint press conference with French President François Hollande on Tuesday, President Obama said he had accepted an invitation to travel to France to commemorate the 70th anniversary of D-Day. Both Obama and Hollande spent a good deal of time talking about the historic bonds between the two countries and both of them said the two countries agree on most issues of substance, including what's best in Syria, Iran, Mali as well as issues like climate change. 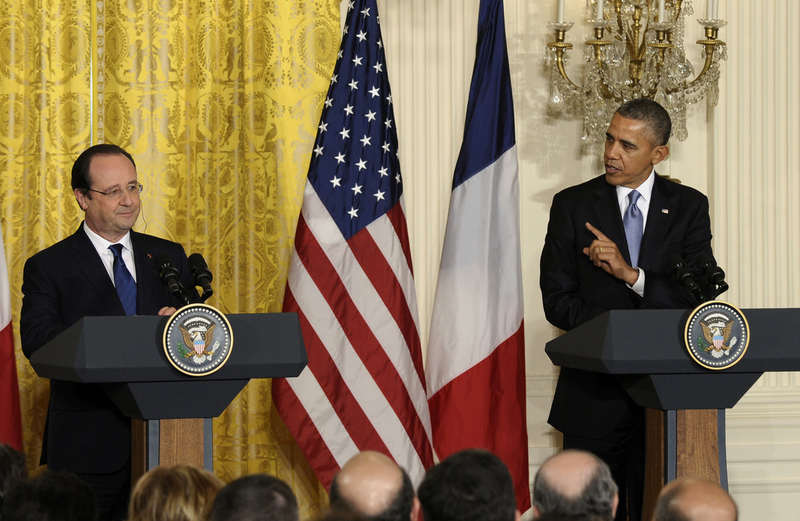 On Iran, Obama said France and the United States "are united on preventing Iran from obtaining nuclear weapons." Both countries, Obama said, agree that new sanctions could scuttle talks with the West. Obama also issued a warning. He said the United States would take swift action against businesses that violate sanctions against Iran. Obama and Hollande were asked about the revelations made by former NSA contractor Edward Snowden, which included reports that the U.S. collected information on regular French citizens. Obama explained that the U.S. doesn't have a "no spy" agreement with any country, including allies. But, he said, his administration has made an "unprecedented commitment" to protect the privacy rights of Americans and foreigners. Hollande said the two leaders spoke about the revelations and "mutual trust has been restored." Obama will host a state dinner for Hollande this evening. President Obama admitted that there is "enormous frustration" over Syrian peace talks. "President Barack Obama says peace talks to end Syria's civil war are far from achieving their goal of halting violence and facilitating a political transition. "Obama says the situation on the ground in Syria is horrendous. He says the state of Syria is crumbling and it's bad for global security. "Obama says there's enormous frustration. But he says not to discount the fact that for the first time recently, Syria's government and opposition rebels sat in the same room together during peace talks." A reporter asked President Obama to pick between two key U.S. allies: Britain or France. Obama said he has two daughters and just like he could not chose between them, he won't chose between the U.K. and France.